As a child of the 80s and young adult of the 90s, I feel like I was a member of the earliest generation whose parents had easy access to consumer level and relatively inexpensive video recording capabilities. While there were previously film-based alternatives to capture life’s ‘regular’ every day moments, the VHS tape really brought home video to the mainstream. Granted, the camcorders my parents used back then were about the size of a small toaster, weighed anywhere from 6-12 pounds, and the recorded analog standard definition video (sub-SD based on today’s definition) to VHS’ smaller form factor VHS-Compact and eventually to full size VHS tapes. 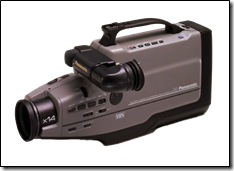 And of course, in those days most camcorders were designed to film through a view-finder as it rested on your shoulder so that your arm didn’t fall off after 10 minutes of recording your 8-year-old’s Ronald McDonald birthday party! After having grown up in a ‘camcorder’ house, surprisingly I didn’t buy my own until about a decade ago while in my early 30s and just after my wedding. 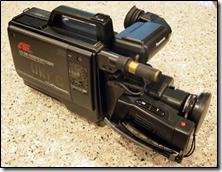 At the time, my first camcorder was one of the earliest to actually record digital video files to a 30GB spinning HD. The files were easily archived and subsequently edited and shared with a simple USB file transfer to a home computer. 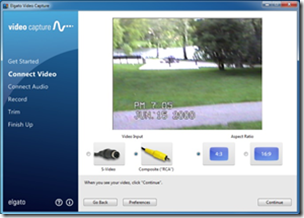 I have since abandoned the sole purpose video camera in favor of capturing family moments on either our DSLR or one of our android phones, depending on the situation. 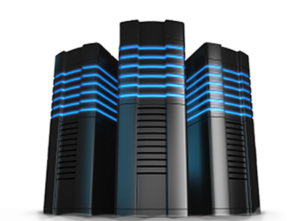 While the compression or container format has shifted among subsequent recording options, the formats are all ‘standard’ and easily convertible to just about any other format / container using easily accessible software packages. As such, I have a very comfortable family video archival situation with high quality and protected (3-2-1 backup) copies of all videos I’ve made over the last decade. These will be available to my kids and grandkids for years to come. Unfortunately, until embarking on this project, this statement was not even close to true for nearly every family video taken from the time I was 11 up through the age of 30! I tend to be a fairly nostalgic person. I genuinely enjoy reflecting on the grand memories and moments in time encapsulated by photos and videos of my life and the lives of loved ones. I’ve become even more nostalgic since losing my father a few years ago when he was just 56 years old – and more critically for me, just 11 months after the birth of my son / his first grandson. Since then, we’ve added a set of twins to the family and I’ve really struggled with the fact that my children did not get to know and experience their grandfather as I was able to for 3 of my own 4 grandparents. How could I convey to them what he meant to me? His sense of humor? Could they appreciate his musical talents and seeing him play 50s, 60s, and 70s music in his ‘oldies’ band on weekends? Could they relate to our collective adventures on camping and fishing trips or my parents’ various visits to see me in college or grad school? Would they ever appreciate or understand my days in ROTC or as a USAF officer out of college? Since I don’t fly any longer, could they somehow experience the fun and excitement of when I would fly my parents around Boston’s Charles River loop and to Nantucket using one of Hanscom AFB flying club’s Cessna? Luckily for me, my dad was also a fairly ‘nostalgic’ man and so many of these types of moments had been captured for ‘posterity’ over the years. I had accumulated a lot of tapes to prove it – I now have at least 70 tapes with ~25 years of family video sitting (and potentially rotting) in my basement. So much good ‘posterity’ does when the standard analog VHS magnetic cassette has a theoretical shelf life of just 10-15 years depending on which website you reference and personally, I had not connected a VCR to a TV for going on 7 years. I had told myself I would take on this video conversion project for the last 4-5 years, probably longer actually. I’m sure many of us have projects just like this that linger and don’t really “need” to be done. Finally this January, after moving several boxes of tapes for the 3rd time in 15 years – this time across the country from Boston to San Francisco, I decided I was finally going to do it. I don’t want to move these tapes again or risk losing them to damage. As a loyal Average Guy podcast listener who was fully aware of the collective TAG.TV audience demographics, I would expect many of you to have similar situations with lots of old magnetic tape video sitting useless in some closet or basement. While some of us in this community are fairly AV savvy, clearly some others are not. For me, I have a great home network and AV set-up. 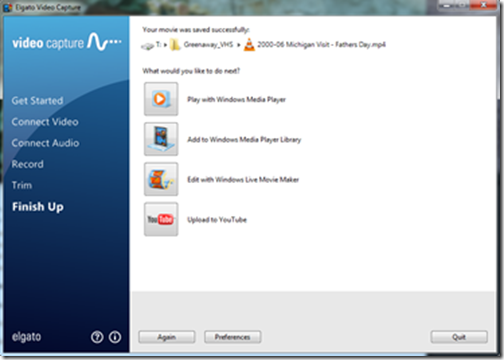 I own and use several video editing and conversion programs, and I stream photos and videos regularly from my homer server to Tivos or Chromecasts through the house. I just did not have a video capture card in my desktop. Nor did I feel like taking on the project to find, install, and configure a card to convert these degrading memories into a digital archival equivalent…. So a few months ago, I approached Jim about leveraging the TAG Tech Scholarship Program for this project. More specifically, the ‘lending library’ structure of that program, since theoretically, I’d only need this device for a set period of time until I’ve converted the collection. 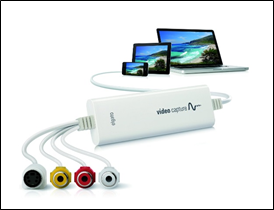 Beyond that, I might as well pass it on to the next guy who is in the same boat as I was… After doing my initial buying research, I landed on the Elgato Video Capture Device which had 4.3 / 5.0 stars based on nearly 800 Amazon reviews. 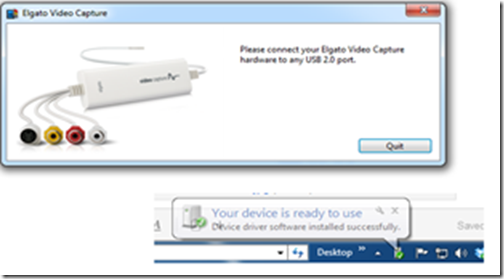 The Elgato device is essentially a dongle that connects to your VCR or camcorder and to a USB 2.0 port on a Windows or Mac computer. 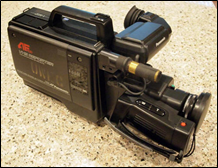 On the VCR side, video uses either (a) an S-video output or (b) a yellow RCA connector and audio records in stereo using red & white RCA-jack style connectors. In my case, it turns out that in the 7 years since last disconnecting my standard VCR, it had stopped working. Shocker! My first challenge in executing on this project was the lack of a player for even a standard VHS tape. After a several week delay, followed by discussing with neighbors and colleagues, I was able to get a working VHS player to test with for my VHS, VHS-Compact (with full-size VHS converter) and S-VHS tapes. In contrast, I need to wait for my next trip to my mother’s house in PA to dig out my dad’s old DV and HDV-based camcorders in our garage in order to finish the project for the rest of the digital-based and higher quality tapes. 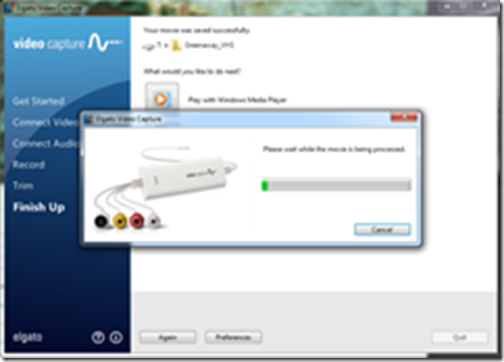 While the Elgato box contained an installation disk for windows drivers and the capture software, I tend to follow the path of going directly to the source for these kind of installations. 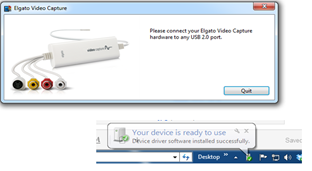 I downloaded latest drivers and software from: http://www.elgato.com/en/video/video-capture/support/update-windows. 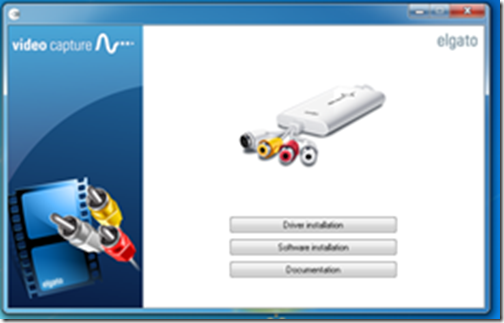 The process I followed was to install the driver file first followed by the software. At the completion of the software installation, I was prompted to connect the dongle to the USB port. At this point, the installation is completed and the software prompted me to cue up the first video. Using the software literally could not be any easier…. I set the default file location and the three “General” tab check boxes. Given that I am recording generally from VHS tapes that are sub-SD resolutions, I’m not sure the High Res Video box is doing anything (resulting MP4 files are 640×480), but I have a decent PC and figure it can’t hurt. I have not noticed the process being slowed down at all). Also, it seemed a good idea to Preserve Source Format – but I haven’t tried it the other way. Again, I have not needed to adjust at all. All videos I have recorded have sounded just fine. 4b – Connect Video and Connect Audio: For a first recording on a particular player device, it’s probably a good idea to test both the video and audio using the screens below. 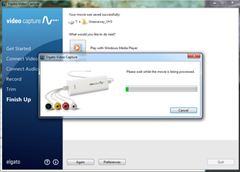 However, once connections are tested the first time, the process to initiate subsequent recordings are simply to click “Continue” through the both Connect Video and Connect Audio screens to get to the Record screen. 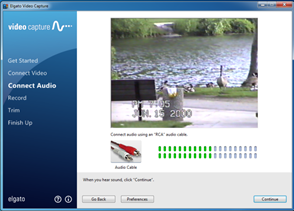 On the video screen, you have a choice to select the appropriate input (S-Video or RCA) and on the audio screen, you merely need to confirm audio is on and loud enough in the software. 4c – Record: Finally, just click the red Record button. 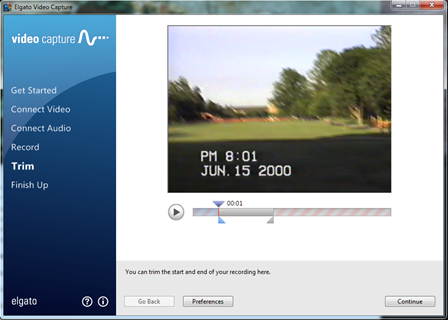 On the record screen, you have the option to stop recording at the time you provided earlier (or uncheck the option if you don’t know how long the tape is or if you prefer to let it record until you manually stop it. I have been mostly running these captures from tapes where I do not necessarily know the length of the video. So I have been using the manual approach and running the capture process in the evenings when I get home from work for the day until about when I go to bed for the evening. Usually enough time for two or three 90 minute tapes. Usually, I’ll just wait for the VCR to be outputting snow (mine actually shows a blue screen instead of snow) and I’ll manually stop the recording. Additionally on this screen, you can mute the sound which is a nice feature since I generally have this running this every night for the last several weeks in the office next to our family room. 4d –Trim: The only limited editing you can do is to trim off any unneeded video that was captured from the beginning or end of the recording. The software does not allow you to edit the video in any other way. 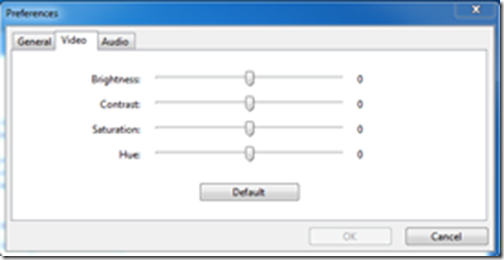 You need to use other third party software for further editing or post-processing. 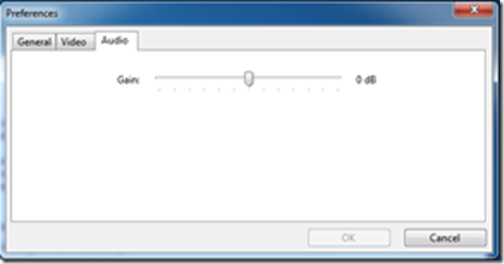 Once the processing is complete, the resulting file size is about 1GB / hour. At this point, there are several options shown below. 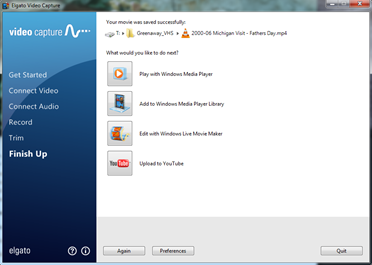 You can play with Windows Media Player, Add to the WMP Library, Edit with Live Movie Maker, or Upload As-is to YouTube. 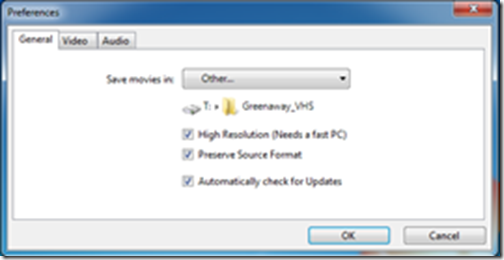 Personally, I use VLC as my Media Player of choice and I’m currently using Video Redo TV Suite for editing, so I have generally not made use of this screen other than clicking the Again button and starting over with the next tape!! Overall, I’m very happy with the quality. A key factor for me to keep in mind was my expectations for video quality. 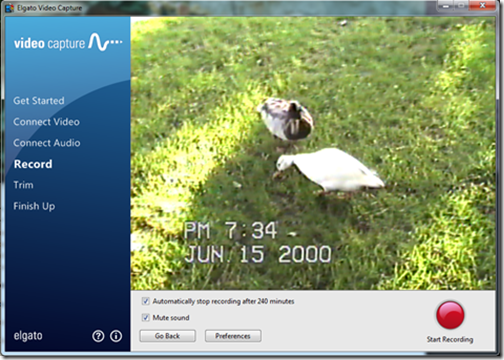 For some analog VHS tapes I have recorded, the quality is not perfect, but it’s not terrible either – it’s exactly what the source tape provided with an original recording that was not great or one that had already degraded a little over time. It has nothing to do with the capture device or software and I can’t ding the tool for poor source content. 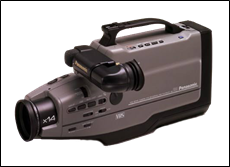 For the most part, the source material is based on NTSC 480x 320 (approximate analog equivalents to digital resolution), the capture device can’t improve on the source resolution or quality. 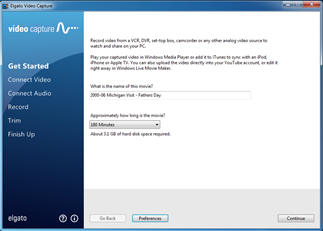 That said, the resulting MP4 file is captured at a 480×640 resolution which, along with 480×720, are resolutions I’ve seen recommended at several media websites associated with this process. I did not get into the technical aspects and arguments of why double the horizontal resolution – 480×640 is the defaults and it worked perfectly. Honestly, I feel a little bad about the ‘review’ component of this post… I don’t feel I was able to be terribly critical of the device. It pretty much does what it says it will. No editing post-processing – only trimming from the beginning and end. Not a big deal for me. I’m just happy to have the videos in a digital format. I’ll trim, splice, and make highlight reels once I have all the capturing done. Fixed capture resolution and format– 480×640 and H.264 and mp4 container. Again not a big deal for me. Given the analog resolution limitations, I’m not sure 480×720 would improve the viewing any. Further, from analog 480 lines of resolution, 720 or 1080 horizontal lines would just be wasting recording space for no added resolution improvement. DO NOT scan through old tapes using FF / Rewind while playing. Rewind to the beginning before hitting play. I had a couple tapes get partially eaten while I was trying to fast forward through them to verify what was on the tape. After having this happen twice, I realized I’m better off recording everything rather than trying to pick and choose.